d. 1927 Colville, Stevens Co. WA. 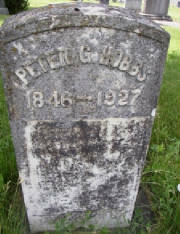 Buried, Highland Cemetery, Colville, Stevens Co. Wa. NOTE: AIDELINIA TRALONA HARGRAVE, b. March 05, 1822, Bourbon Co., Kentucky or Indiana; d. February 07, 1905, Kingsville, Johnson Co., Missouri. Marriage: Solomon T. Hobbs b: 3 MAR 1817 in Haycraft Fort, Severns Co., Kentucky. Thomas D. Hargrave, born Abt. 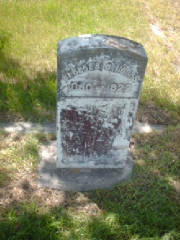 1797 in Logan Co., Kentucky, and died April 27, 1874 in Putnam Co., Missouri. He married CELIA FRENCH December 26, 1816 in Posey Co., Indiana, daughter of MOSES FRENCH and JOSEPHINE UNKNOWN. She was born Abt. 1798 in Kentucky, and died 1850 in Putnam Co. Missouri. Higland Cemetery, Colville, Stevens Co. WA.